Excellent teaching takes place in American higher education. Teachers striving for mastery of their craft have much to share. Bringing teachers together in a relaxed, informal atmosphere to share their successes and their experiences enhances the skills of all. 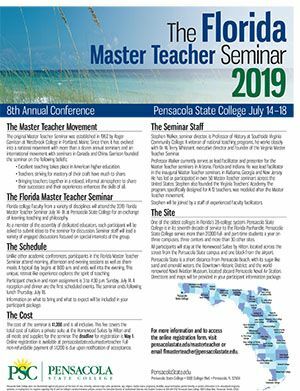 Florida college faculty from a variety of disciplines will attend the 2019 Florida Master Teacher Seminar July 14–18 at Pensacola State College for an exchange of learning, teaching and philosophy. As a member of the assembly of dedicated educators, each participant will be asked to submit ideas to the seminar for discussion. Seminar staff will lead a variety of engaged discussions focused on special interests of the group. The cost of the seminar is $1,200 and is all inclusive. This fee covers the total cost of tuition, a private suite at the Homewood Suites by Hilton and all meals and supplies for the seminar. The deadline for registration is May 1. Online registration is available from this page. Full non-refundable payment of $1,200 is due upon notification of acceptance. Unlike other academic conferences, participants in the Florida Master Teacher Seminar attend morning, afternoon and evening sessions as well as share meals. A typical day begins at 8:00 a.m. and ends well into the evening. This unique, retreat-like experience explores the spirit of teaching. Participant check-in and room assignment is 3 to 4:30 p.m. Sunday, July 14. A reception and dinner are the first scheduled events. The seminar ends following lunch Thursday, July 18. Information on what to bring and what to expect will be included in your participant package. One of the oldest colleges in Florida’s 28-college system, Pensacola State College is in its seventh decade of service to the Florida Panhandle. Pensacola State College serves more than 27,000 full- and part-time students a year on three campuses, three centers and more than 30 other sites. All participants will stay at the Homewood Suites by Hilton, located across the street from the Pensacola State campus and one block from the airport. Pensacola State is a short distance from Pensacola Beach, with its sugar-like sand and emerald waters; the Downtown Historic District; and the world-renowned Naval Aviation Museum, located aboard Pensacola Naval Air Station. Directions and maps will be provided in your participant information package. Stephen Walker, seminar director, is Professor of History at Southside Virginia Community College. A veteran of national teaching programs, he works closely with Dr. W. Terry Whisnant, executive director and founder of the Virginia Master Teacher Seminar. Professor Walker currently serves as lead facilitator and presenter for the Master Teacher seminars in Arizona, Florida and Indiana. He was lead facilitator in the inaugural Master Teacher seminars in Alabama, Georgia and New Jersey. He has led or participated in over 50 Master Teacher seminars across the United States. Stephen also founded the Virginia Teachers’ Academy. The program, specifically designed for K-12 teachers, was modeled after the Master Teacher movement. Stephen will be joined by a staff of experienced faculty facilitators.